What Does a Genetics Nurse Do? Where Do Genetic Nurses Work? A genetics nurse is an RN with additional training and education in genetics. Genetic nurses care for patients who are at risk for, or are affected by, diseases with a genetic component including cancer, heart disease, diabetes, and Alzheimer's disease among others. In addition to providing direct patient care, genetics nurses also perform risk assessments, analyze the results and counsel patients on the ongoing management of their conditions or conditions they may be at risk for. Within the highly scientific and research-based specialty of genetics, the genetics nurse plays an important role as patient advocate and compassionate support system. In order to become a genetics nurse, students must first complete their Bachelor of Science degree and pass the NCLEX-RN exam. RNs with a BSN degree may then begin entry-level clinical work in hospitals, genetics labs, clinic, cancer centers, etc. However, many genetics nursing positions require a Master's of Science in nursing degree with an emphasis on genetic nursing, as well as certification as an Advanced Genetics Nurse. Once a nurse has completed his/her MSN program and completed 1500 practice hours in the genetics specialty, they are eligible to become certified as an Advanced Genetics Nurse by the American Nurses Credentialing Center. To search and apply for current genetics nurse positions, visit our job boards. What Are the Education Requirements for Genetics Nurse? Genetics nursing positions require a minimum of a BSN degree and an active RN license. Due to the complex nature of genetic testing and predisposition, many positions may also require an MSN degree with emphasis on genetics nursing and professional certification as an Advanced Genetics Nurse. Some, but not all, genetics nursing positions require professional certification as an Advanced Genetics Nurse, which is offered by the American Nurses Credentialing Center. In order to be eligible for this exam, nurses must hold a current RN license, hold an advanced level nursing degree (MSN or higher), have practiced the equivalent of two years full-time as an RN and have a minimum of 1500 practice hours in the specialty of genetics. A genetic nurse can work in a variety of settings, including specialty genetics clinics where gene-based diagnoses and therapies are offered, prenatal and reproductive specialty centers, hospitals, cancer centers, and specialty medical practices. Many genetics nurses work in a particular sub-specialty of medicine where genetics play an important role, such as obstetrics and reproduction, oncology, mental health and pediatrics. 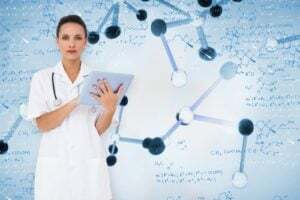 For nurses who specialize in genetics education or research, positions may be found in government or non-profit research centers, academic institutions or in the biotechnology industry. A genetics nurse cares for patients who are at risk for, or are affected by, a genetic disease or condition. They provide direct patient care, perform and analyze genetics risk assessments and educate patients and families on their risk profiles for various genetic conditions and how this risk may impact their ongoing health management. What Are the Roles and Duties of a Genetics Nurse? According to the National Human Genome Research Institute, genetics nurses can expect a median salary of around $62,450, with a range of $43,410 - $92,240. Genetics is a fairly new and growing segment of the healthcare industry, and as the general population ages and genetic science continues to expand, genetic nurses are expected to be in high demand.